White kitchens are on the top of the list for most popular and we think that’s because they never date. White always looks sharp and fresh in any home. Sounds simple to choose a white kitchen and once you choose the finish be it gloss or matte we know it will be one of the best decisions you can make. With a white kitchen you can always add splashes of colour or mix it up with a simple vase of coloured flowers and some black pendant lights as seen here can provide that “added touch” to create warmth! A tip to remember when designing white kitchens – although they can look clean and fresh a complete white look can also look ‘cold’. Important to remember to break the white up and a popular choice these days to prevent this is by adding timber. Not only will your white kitchen look clean and fresh but instantly a warmth is added to the heart of the home. 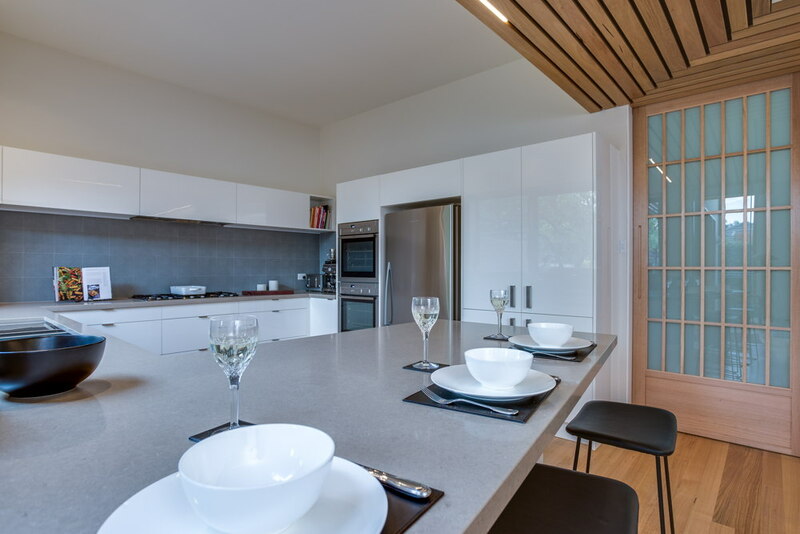 Some of our best kitchen designs have used this result and as seen below timber has been added to the neighbouring open living space door and roof to produce an absolutely stunning kitchen whilst adding enormous value to the home. The addition of hardwood flooring and contrasting stone benchtops add different textures and finishes which all blend with the white gloss finish. A further option is to create a feature splashback of interesting tiles which tie all finishes beautifully highlighted against your white kitchen. 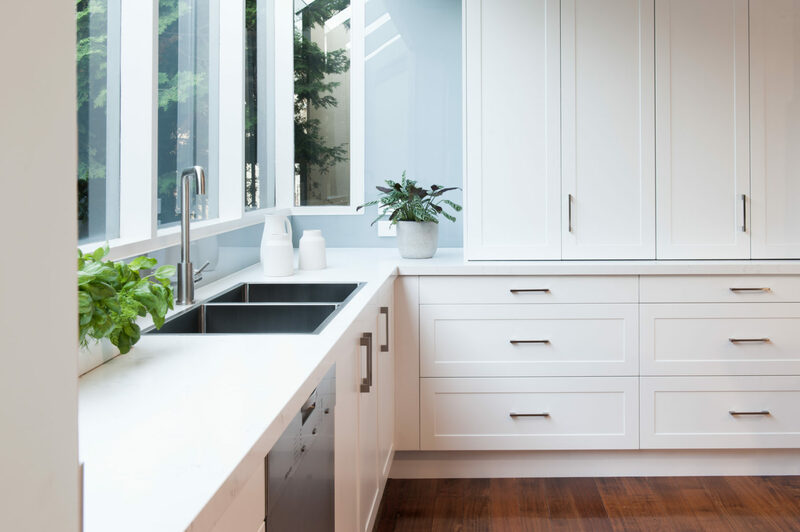 One thing’s for sure a white kitchen will always look timeless and always popular and we know this because our customers return time and time again to buy another “white kitchen”. 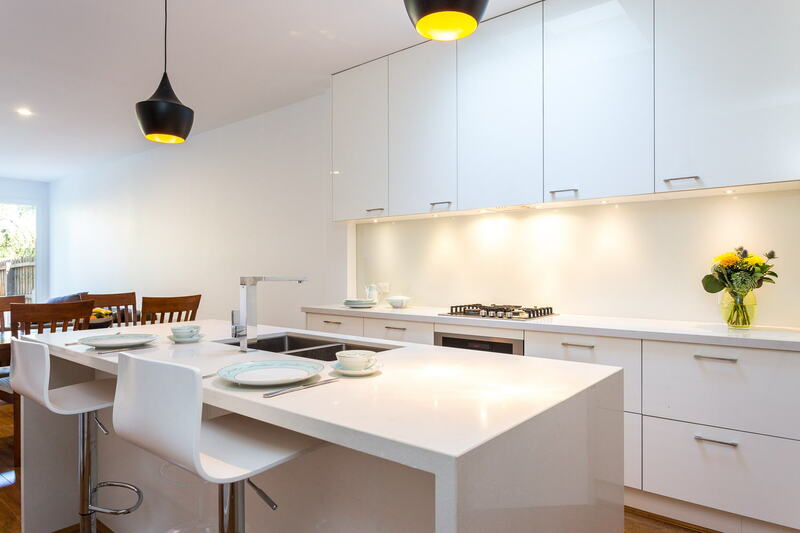 Check out all our white kitchen designs here.